St. Croix is one of the most desirable locations at Silver Shells Resort, as it directly faces the gulf and is only steps to the beach. 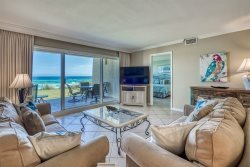 This gulf front unit is stylishly appointed, featuring floor to ceiling views of the gulf in the living area as well a spacious gulf front master bedroom! The fully equipped kitchen has everything you need for your vacation. If you don't want to cook, that's okay! Silver Shells is located in the heart of Destin, close to several great restaurants as well as shopping, entertainment, and recreation. Each bedroom as well as the living room are equipped with their own TVs and DVD players, as well as complimentary WiFi. Add $160 for housekeeping and 11% for tax. There is a $69 damage waiver, $30 booking fee, and 2.5% to process credit card payments. A credit card on file and 25% down applied toward your rental fee will hold the unit for you.